Callicarpa macrophylla Vahl, Symb. 3:13, t.53. 1794. Clarke in Hook. f., l.c. 568; Collett, Fl. Siml. (rep.ed.) :380.1921; Parker, For. Fl. Punj. ed. 3: 393.1956; R.R. Stewart, Ann. Cat. Vas. Pl. W. Pak. & Kash. 605.1972. Erect, evergreen shrub, 1-2(-3) m tall, densely and stellately woolly-tomentose on young branches, lower surface of leaves, petioles and peduncles. Leaves opposite, 10-25 (-30) cm long, (2.5-) 5-7.5 cm broad, ovate-lanceolate to oblong-lanceolate, acuminate, crenate, dark-green and glabrescent above, pale or dull and densely woolly below; petiole (6-)10-15(-20) mm long. Cymes axillary, dense, dichotomously branched, up to 5 cm long, including 1 2.5 cm long peduncles. Flowers c. 4 mm across, pink or reddish. Calyx c. 1.7 mm long, campanulate, minutely 4-toothed, densely pubescent. Corolla c. 2.5 mm long, with tube c. as long as the calyx; limb somewhat 2-lipped, with 4, short lobes. Stamens 4, exserted; anthers c. 0.8 mm long, ovate-oblong. Fruit globose, 2-3 mm in diameter, whitish, with a hard endocarp, usually breaking into four, 1-seeded pyrenes. Type: Habitat in India orientali, Koenig. Distribution: Sub-Himalayan tracts of Pakistan, India and Bangla Desh. Callicarpa nudiflora Hook. & Arn. (Callicarpa reevesii Wall. ex Schau.) 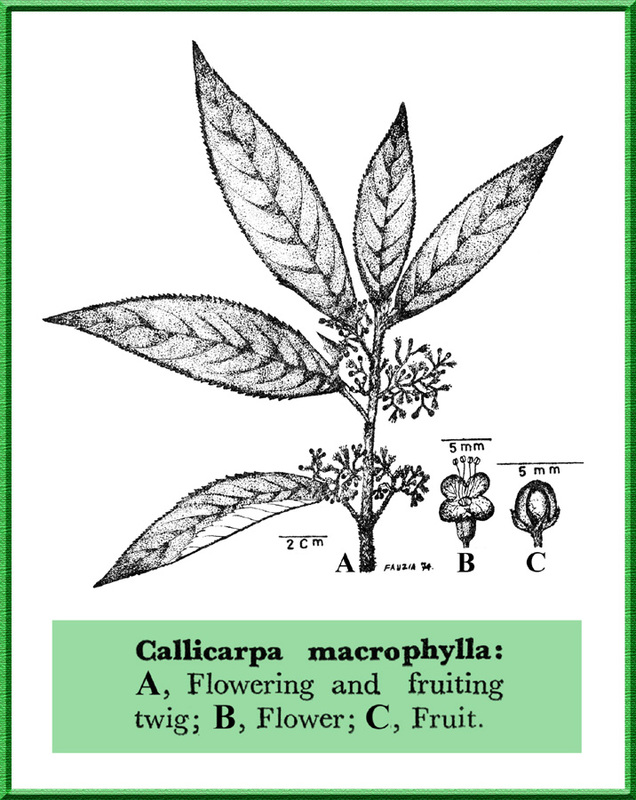 (with peduncles lax, 3.5-6 cm long) and Callicarpa longifolia Lam. (with leaves sparsely pubescent on both surfaces and shorter cymes), very similar to this species, have been reported to be cultivated at Peshawer and Lahore by Parker (l.c. 393) and R.R. Stewart (l.c. 605) respectively.